Best Ski Slope View, Ski-in Condo. Easy Walk! 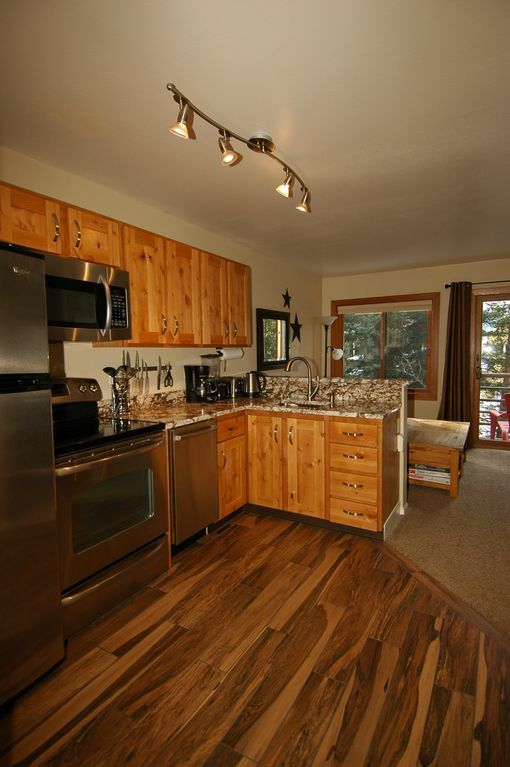 Ski-in, walk to lift, walk 3 blocks to Main Street, & ski slope view. It doesn't get better than this! Granite countertops installed in 2018. Recent remodel with knotty alder cabinets, new upgraded windows, fresh paint, carpet and Brazilian Pecan tile. Bedroom upgrade with Arhaus St. Lucia bed and finely crafted alder dresser and nightstands. Fairfield Townsend Bistro table, countertop height, and Amisco swivel stools. Best view in the building at Wildwood Suites (AKA Wildwood Lodge)! You can see the top of Peak 10, the ski slope, and the stream from our condo. This location is incredible. A gem surrounded by trees and located right next to a stream. In the winter, ski right to the back door on 4 O'Clock ski run. In the summer, sit on the deck and enjoy the peaceful sound of the stream. Relax in the sauna or large outdoor hot tub. This top (second) floor, corner condo is sunny, quiet, and modern. Walk three blocks to Main Street (shopping and restaurants) or one block to the bus stop. Even better, walk five minutes to the Snowflake ski lift (access to Peak 8 & 9) or ski to the free shuttle. Ski-in via 4 O'Clock ski run. Also, please select the link below to view my website for additional pictures, lift ticket & ski rental discounts, maps, child care, and restaurant recommendations. Living nearby in Golden, Colorado we spend a lot of time at our condo and we're sure you'll feel right at home. Robes, fluffy towels, 8 pillows, and nice sheets. The condo is fully equipped for cooking with everything from a crock pot to a fondue pot, including Wusthof knives, All-Clad Cookware and a Blendtech blender. We try to keep extra items stocked such as soap, shampoo, conditioner, lotion, laundry detergent, tea, olive oil, and spices just to name a few items. Please call (mountain time zone) or email (click 'Email Owner' button) or click the 'Book It' button to make a reservation. The 'Detailed Price' link below the 'Book It' button will give you a quote. Maximum occupancy 4 (monthly max occupancy 2) perfect size for a couple or cozy friends and family, 1 parking space. No pets or smoking. Note: Condo is not available long-term or monthly during the ski season. We also have a property in Steamboat Springs, CO: VRBO #732595 and in Snowmass Village, CO: VRBO #1376497. Keywords: Condominium, ski-in, walk, sunny, mountain view. My name is Tammy Snyder, I was married August 2009 and my maiden name is Tammy McMinn. My husband is a retired firefighter and active in search and rescue missions. We are both outdoor enthusiasts and love to travel. I traveled through the Alps snowboarding for 3 months during the 1996/1997 winter and visited 12 ski stations among my favorites are Chamonix, France and Verbier, Switzerland. In 1998, I set a world record in snowboarding 305,525 vertical feet in just under 15 hours. As you can guess, my greatest passions in life are snowboarding, telemark skiing, biking, rock climbing, and the mountains. Our condo in Breckenridge is our oasis, please enjoy your stay! The stream right near the deck, view of Peak 10, and quiet street all attracted me to the building location. Plus Breckenridge is one of the best ski towns in Summit County. After traveling through Southeast Asia for over a year, especially while trekking through Nepal, I developed a knack for finding excellent places to stay. My preference was a sunny, top corner unit with a great view. I looked at nearly a dozen properties in Breckenridge until I found exactly what I was looking for. As a bonus I can easily walk to town, walk to the ski lift, and ski home to the back door. You'll find these similar qualities in our other mountain condos in Breckenridge, CO (see my other VRBO Listing #29646) and Snowmass Village, CO (see my other VRBO Listing #1376497). Free parking lot; only 1 car allowed for my condo. Wireless internet access is free. The wireless service was upgraded. We try to keep items such as spices, olive oil, coconut oil, balsamic vinegar, and tea on hand. iHome stereo bluetooth w/radio for iPad, iPhone and iPod. Several board and card games. Several movies for adults and children. Stream less than 25 feet from the deck. 2 deck chairs. Ski-in and walk five minutes to the Snowflake ski lift (access to Peak 8 & 9) or ski to the free shuttle. Large outdoor hot tub surrounded by trees. No A/C, but a ceiling fan helps to keep this unit cool in the summer. This is by far the most convenient and comfortable condo we have ever stayed in. Very clean, quiet, and thoughtfully decorated and stocked. Short walk directly to the lift, downtown and very easy access all around. This is a top floor corner unit, so not much noise at all from neighbors and a nice view of Peak 8. Highly recommend! The condo was very clean and comfortable for two people. It was very well-equipped, especially the kitchen. The location is convenient for skiing, although we did not consider it easy for ski-in or ski-out. We chose to take a very short drive to the gondola parking lot (less than two minutes). We would consider using it again. Nice place , quite , súper clear, good located . But, price is high ..
My husband and I just finished up a lovely week in Breckenridge. We loved the condo. It is exactly as pictured and described. Furnishings are nice, in good shape and very comfortable. Things like sheets and towels are good quality. We really love that that the kitchen is fully equipped for making real meals and it's so nice to have things like spices, cooking oil, herbal teas in the pantry. I also appreciate things like shampoo, hair dryer, humidifier, cozy robes for the hot tub, all being available. And, there's no extra "stuff". The unit is very quiet, and has lovely mountain views. It's an end unit and the building itself is small-medium size. We are both avid skiers and love the short walk (5-10 min) to the chairlift. Breckenridge is a huge mountain and we skied 5 days in a row without getting bored. We enjoyed some meals at the lodges but also loved coming back to the condo for lunch some days. The town of Breckenridge is fantastic. It's so picturesque and full of restaurants, saloons, ski shops (great because I needed new gloves), as well as clothing and jewelry stores. The owners provided lots of good recommendations (#1 - make reservations, esp during peak weeks). There's also a local supermarket full of the usual goods and lots of tasty treats. Car? Shuttle? You can go either way. We rented a car but you could easily take a shuttle and use Lyft or Uber if your wanted to hit a supermarket. The condo is so close to Main Street/town that it's easy to walk. The owners are both proactive and responsive. They share a tips/guide in advance and respond quickly if you have any questions. We hope to come back for a week next winter! Dan and Tammy's condo at 120 Sawmill was a perfect place for a ski week at Breckenridge. It was well appointed with everything you need. The bed was super comfortable, and the view from the condo was super. With some careful planning you can ski almost to the back door of the condo building. The ski lift, and ticket window is a short walk and a little up hill, but manageable. We ate out on Main Street every night, and the walk was only a few blocks. We had nice meals at Ember, South Ridge Seafood Grill, and Briar Rose Chophouse and Saloon. The only disadvantage is that there is no washer and dryer in the unit, but there is a laundry room conveniently located in the building. This is definitely outweighed by the location, and furnishing of the condo. I would definitely stay here again. Max occupancy 4 (*monthly max occupancy 2), 1 parking space. No pets or smoking. No phone in condo, please use your mobile phone. *Monthly Rate: Stay 30/nights or more and there is no sales tax, the security deposit is higher and we also charge a cleaning fee. Please email for quote.